I want to thank you for the manuals this will be big help!!!!! yanto wrote: I want to thank you for the manuals this will be big help!!!!! You are most welcome Yanto! Glad to help a new member of the Forum! 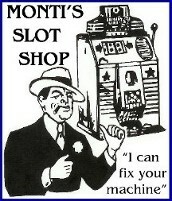 Enjoy the hobby that is the Collection of Vintage Slot machines! You have a Columbia Standard, a late production (probably late 1940s) featuring 20-stop reels... I think your machine was listed on eBay in MA recently. 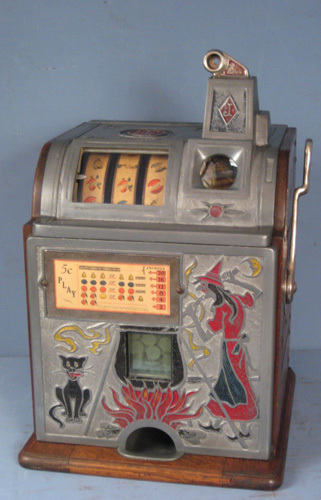 At any rate, many a Columbia sit for decades in non-operational condition due to simple coin jams resulting from small adjustment problems which are well covered in this article... the coin advance and coin vestibule gate linkage adjustments are particularly critical for avoiding spontaneous, annoying coin jams in otherwise well-functioning machines. Also, a worn clock-- which won't appear worn at all!-- can be the cause of some very flaky and sporadic malfunctions. i feel humbled by your vast knowledge. Hey all.. New Myself and we have a Columbia that my mother -in-law brought in when she moved into our house recently. It had worked for years and they would like me to get it back up and running if able. The Handle has a similar situation as Yanto, where the handle is sort of free flowing. It gets to the bottom of its pivot and will stay there. I have pulled it out of the cabinet and reattached the arm. In the pictures you have up top it is the Circular Coin Head photo on top. I am sure there is a jam somewhere but I am not seeing it. All the coins are out of the unit. From some of the pics I have seen, it looks like the unit is in "Mid Pull" Any advice on where to start or free up to get things moving again? Earlier in this particular thread I had posted a couple of manuals on these particular slots for download in pdf format! They are fairly basic but was what the company sent out! Papamouse wrote: Hey all.. New Myself and we have a Columbia that my mother -in-law brought in when she moved into our house recently. It had worked for years and they would like me to get it back up and running if able. The Handle has a similar situation as Yanto, where the handle is sort of free flowing. It gets to the bottom of its pivot and will stay there. I have pulled it out of the cabinet and reattached the arm. In the pictures you have up top it is the Circular Coin Head photo on top. I am sure there is a jam somewhere but I am not seeing it. All the coins are out of the unit. From some of the pics I have seen, it looks like the unit is in "Mid Pull" Any advice on where to start or free up to get things moving again? First, go to this thread and find the "1-2-3" illustrated instructions for clearing the typical coin jam on a Columbia mech (you can swap the order of instruction #1 and #2 if you like). Don't forget to replace the little cover plate! Now, try pulling the handle while holding the indicated linkage bar down vertically; this should engage the handle to allow the mech to cycle. Let us know if that works. If it does, your problem is a malfunction with the coin detector just below the coin entry and/or its linkage, which wraps all the way around the back of the machine, and is a frequent cause of the sort of trouble you describe. Got the manuals and finally deciphered most of what it was trying to say.... Thanks for those. Was up an insane amount of time the other night working on this with the wife. Finally started taking the center post items off and found everything was frozen up. Mix of old oil and dirt and non care internally for a while. Finally got it up and running with a combination of cleaning, re-oiling, and tears. There looks to be a few things inconsistent with it now but it works most the time. The big issue now is when handle is pulled the first reel stops rather quickly. Everything slides pretty well but at the end of all the motions the clock doesnt return the main shaft back all the way. Thinking it is wear and tear but cleaned the cloack really well. The only thin that helps is pulling down on the back of the main cam to finish the motion. All that for this question. If I get a stronger spring to assist will that work or mess up another function? PS thanks for posting the manuals. they were instrumental in finding all the things not working. Papamouse wrote: Got the manuals and finally deciphered most of what it was trying to say.... Thanks for those. Was up an insane amount of time the other night working on this with the wife. Finally started taking the center post items off and found everything was frozen up. Mix of old oil and dirt and non care internally for a while. Finally got it up and running with a combination of cleaning, re-oiling, and tears. There looks to be a few things inconsistent with it now but it works most the time. The big issue now is when handle is pulled the first reel stops rather quickly. Everything slides pretty well but at the end of all the motions the clock doesnt return the main shaft back all the way. Thinking it is wear and tear but cleaned the cloack really well. The only thin that helps is pulling down on the back of the main cam to finish the motion. When reels stop very early in the cycle, that is the primary indicator of a worn clock, as discussed on pg. 10 of the Groetchen "Instructions" booklet, "How to Operate Your Columbia." In my experience, it is practically impossible to find any obvious wear on a worn-out Columbia clock-- you simply have to replace it with a good, NOS one. You may want to make sure that the fan blades aren't budging a little on the spindle; touching a bit of "superglue" or "locktite" to the solder joint where the vanes join the spindle can fix that problem, but be sure that none of that adhesive gets anywhere else on the clock! The failure of the mech to complete the cycle-- stopping just short of that final "clunk" sound of the final reset-- is a problem I've dealt with more than once. The indicated spring has been the culprit each time: it needs to maintain some tension even past the end of the cycle to do its job, but I'm afraid it anneals or slackens over time. Give it a tug when the cycle fails to reset and you'll see that it only needs pull another 1/16"-1/8" to get there, but can't. Try shortening the coil or wire loop a little in order to re-tension it to do its job at the end of the cycle, and I think you'll see an improvement.